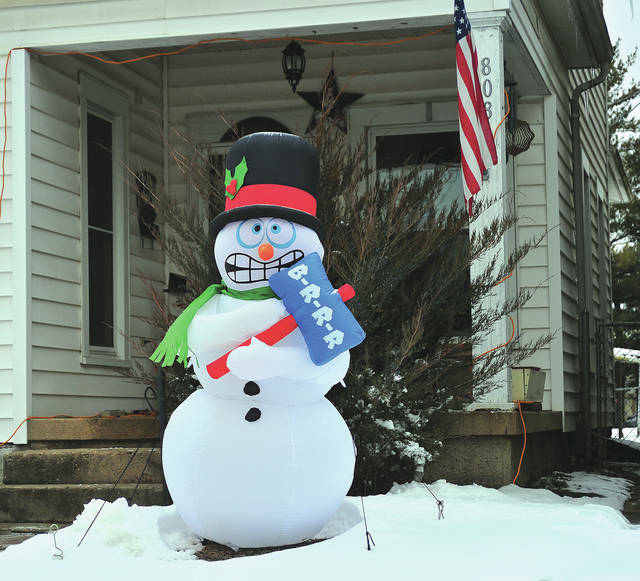 Mike Ullery | Miami Valley Today This shivering Frosty the Snowman seems to have nailed the prediction for our weather forecast in coming days! MIAMI COUNTY — Communities in Miami County are bracing for snow this weekend, readying road crews and snow plows. According to the National Weather Service office in Wilmington, the Miami Valley can expect snow on Saturday, followed by bitter cold through Monday. A hazardous weather outlook from the agency forecasts a strong winter storm with the “potential for significant snow” will hit the region Saturday. Meteorologists in the agency’s Wilmington office could not speculate how much snow will accumulate this weekend, but the forecast predicts a 100 percent chance of precipitation. “An Arctic airmass will bring gusty winds Saturday night into Sunday, with bitterly cold subzero wind chills possible Sunday night into Monday,” the outlook reads. Tipp City staff and police keep a close eye on the weather and roads to decide when to plow, city manager Tim Eggleston said. He said the city starts clearing roads after about 3 inches of snow accumulate. He added that road salt is ineffective when the temperature gets too cold, so the city tries to avoid wasting salt. When it comes to residential subdivisions, the city mostly salts intersections, not the roadway, he said. The city of Piqua is also prepared for winter weather conditions this weekend and is ready to address adverse road conditions. “We just received this week 500 tons of salt,” Piqua City Manager Gary Huff said. The city is also using an environmentally-friendly, non-corrosive de-icer called Beet-Heet to combat ice and slick roads instead of their previous use of brine mixtures, or salt water, for anti-icing or pre-wetting measures. West Milton Director of Service Ben Herron said he too will be keeping a close eye on the weather forecast heading into the weekend. Herron acts as the coordinator between village administration and police and fire during weather events. “Service staff will triple check all of our snow removal trucks and tractors. We will decide if and when we begin pre-treatment and what mixtures of salt brine and salt enhancers (such as Beet-Heet) we may be using,” he said. He added that the village received about 100 tons of salt Thursday morning to bring them up to 100 percent storage capacity. Herron said the village works directly with the police department to monitor accident-prone areas and uses digital thermometers to check pavement temperatures. He reminded drivers to give snow plow drivers plenty of time and space and to move parked cars off the street. The city of Troy has 550 tons of salt in storage at this time, according to Director of Public Service and Safety Patrick Titterington. The city uses 60-90 tons of salt on the main and secondary streets and another 30 tons if local streets need treated, he said. Titterington said city residents can help the street crews clear their streets in a safe manner by removing parked vehicles off the roadways if possible. Also, residents should refrain from shoveling, plowing and/or pushing snow from their sidewalks and driveways into the street and to move snow to the front or side yards. “As always, our response will be tailored to the event that we have, meaning that every event is different depending upon the amount of snow, how quickly it comes down, whether it’s heavy, wet snow or lighter snow, and what time of day or night it starts,” Titterington said. “So, given that the forecasts have varied greatly over the past several days and even hours, our exact response remains undetermined. https://www.dailycall.com/wp-content/uploads/sites/30/2019/01/web1_011519mju_shiveringfrosty-2.jpgMike Ullery | Miami Valley Today This shivering Frosty the Snowman seems to have nailed the prediction for our weather forecast in coming days!